Tower Bridge Exhibition explores the history of the Bridge as well as the development through its time as a totally functioning bridge, offering a high level walkway across the two towers. When the London Bridge had been built, it was initially the only crossing used over the Thames. It is said that more than 50 designs had been submitted for consideration of the winning design. The construction of the bridge took around 8 years to build with about 432 workers. Prior to 1977, the bridge had been brown in colour till it was painted red, white and blue in celebration of the Queen’s Jubilee. The Tower Bridge Exhibition launched its most momentous development since 1982, the glass walkway and housed in the West Walkway, visitors get the opportunity of admiring the tower Bridge from an exceptional perspective, looking down on the passing boats and pedestrians underfoot as well as catch the bascule rising if one is lucky to witness it. A London bus driver once had to jump between the two raising bascules when his number-78 bus seemed to be caught on the bridge while it was being raised. 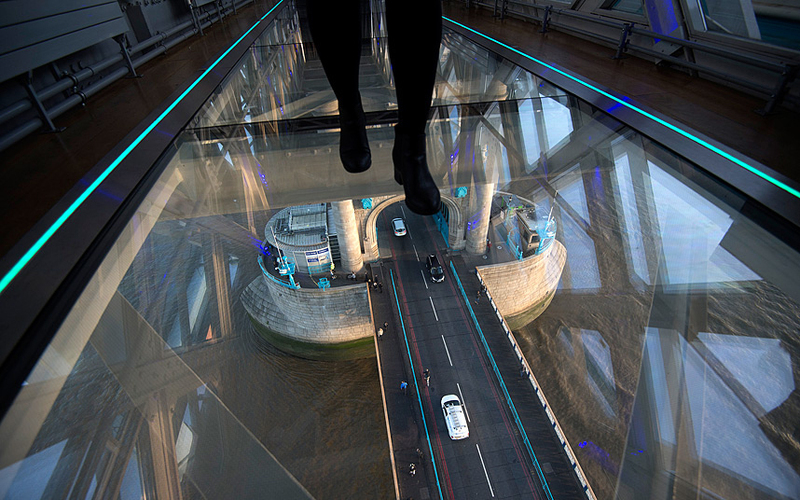 The glass walkway is an opportunity one should not miss out which is 42m above the river and the glass is made up of five thick layers which can hold the equivalent weight of an elephant and two taxis which seems to be quite safe. The Victorian Engine Room tends to hold the coal driven steam engines which was earlier used to power the bridges. The interactive information panels support visitors in learning about the development of technology that was utilised years ago to keep the bridge active, complete with sounds and smells which takes one back through time. One can also get the experience of a virtual Bridge lift demonstrating how the bascules are elevated. The East Walkway provides breath-taking views from the high level walkway with the museums and historic buildings surround the Thames comprising of the HMS Belfast together with the Tower of London. It also houses the exhibition `Great Bridges of the World’ portraying more than 20 bridges of exciting manufacture. The glass floor scheme was known internally as the `wow project’ and also ensuring that there is not the slightest chance of the glass cracking wherein engineers had to contemplate in making it anti-slip and easily reversible if the future generation oppose it. Specially installed lighting will ensure that all modesty is secure.